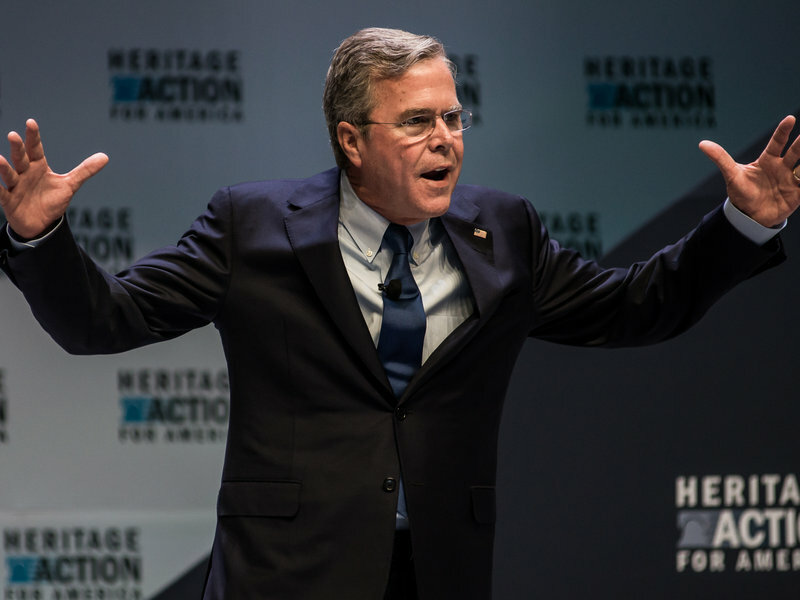 Jeb Bush is the latest Republican to offer an alternative to Obamacare. Republicans in Congress and on the campaign trail call for an Obamacare repeal all the time. Plans to replace it are rarer, though. Obamacare is a fantastically complicated policy, and overhauling the health care system would likewise be a complicated business, affecting not only government spending and the economy, but people&apos;s very lives on an intensely personal level. This week, presidential candidate and former Florida Gov. Jeb Bush released his own detailed proposal for repealing and replacing the Affordable Care Act. In a speech and an op-ed in the New Hampshire Union Leader, Bush announced his plan is aimed at cutting health care costs. Here&apos;s what his plan would do. What are the basics of Bush&apos;s plan? Repeal Obamacare, providing its 17 million participants a "transition plan" away from the program. Give people tax credits to buy catastrophic health care plans. Replace the so-called "Cadillac Tax," albeit with a policy similarly imposing higher taxes on expensive health plans. Allow some businesses to contribute toward their workers&apos; health insurance, in lieu of providing that coverage themselves. Eliminate the benefits the ACA requires health plans to provide. Increase the maximum amount that people can contribute to their health savings accounts from $3,350 to $6,650. Cap federal health spending to states, creating what appears to be a block grant-likeMedicaid program. Would it lower health care costs? Bush&apos;s plan would make it cheaper to buy your own insurance, says one expert, but there would be trade-offs — lower costs could mean fewer benefits. "I have no doubt that premiums in the individual market would be lower under Bush&apos;s plan, mainly because there would be less regulation of the benefits those plans have to offer," said Larry Leavitt, co-executive director of the Kaiser Family Foundation&apos;s Program for the Study of Health Reform and Private Insurance. Bush&apos;s plan gets rid of the requirement that plans cover certain things (Obamacare&apos;s "essential health benefits"), like maternal care and mental health. Rather, it encourages so-called "catastrophic" health insurance plans — bare-bones plans that protect people in expensive emergency situations. Those plans tend to not only have lower premiums but also higher deductibles. "Bush emphasizes high-deductible plans and [health savings accounts] and wants to encourage those plans. High deductibles do discourage people from using services and lead to lower health spending overall," Leavitt said. The plan also would relax Obamacare&apos;s guaranteed coverage for pre-existing conditions. Instead, it would only guarantee it for people with "continuous coverage." Defenders say this would stop people from getting coverage only when they are sick, but detractors say this makes it too easy to not be covered, as financial hardship or employment changes can easily interrupt coverage. That provision could likewise lower costs by lowering the number of chronically ill people in risk pools. Altogether, the plan looks like it could easily lower health care spending. "Do I believe that his plan will cost less than the current status quo under the Affordable Care Act? I believe the answer is yes," said Mark Fendrick, a professor at University of Michigan&apos;s medical school and public health school. But there are a lot of "buts" to tack on here. For one, there&apos;s still a lot we don&apos;t know — for example, how much the plan might cut spending on low-income Americans&apos; health care, as well as how much those new tax credits would cost compared to what&apos;s in place right now. Another thing to consider is where that cost-cutting comes from — is lower-cost health insurance always better, or is it at some point detrimental to customers? Bush&apos;s policies would curb cost growth to an extent, said Sabrina Corlette, senior research fellow at Georgetown&apos;s Health Policy Institute, but she added a caveat: "I would note that they do so on the backs of consumers, rather than tackling some of the more thorny issues such as how we pay providers and suppliers." Moreover, Fendrick said, focusing too intently on costs might be wrongheaded. "I did not go to medical school to learn how to save people money," he said. "So when the first question always is whether we should save money on health care or not, that is largely irrelevant to the bigger question of whether this would make people healthier or not. ... My answer is probably not." OK, so would it make people healthier? The unsatisfying answer is that it&apos;s impossible to know. But here&apos;s what we do know: One thing is that the plan would remove Obamacare&apos;s mandate that people get coverage. Removing that, as well as requirements that businesses provide coverage, could easily leave many fewer people insured. But does less coverage mean worse health? There&apos;s some evidence of this, but it&apos;s not entirely clear-cut. One 2008 meta-analysis, for example, found that health care access increased self-reported health, the use of preventive services, and lowered mortality. But a recent, well-known study of Medicaid in Oregon was more mixed — going on Medicaid was associated with lower rates of depression and better self-reported health (as well as increased financial stability) but no statistical difference in blood pressure or cholesterol. People sought out more diabetes treatment, but improvements in their health also weren&apos;t significant. Meanwhile, higher-deductible plans seem to reduce health care usage, as a recent study found. That might be good, in the sense that it might reduce unnecessary doctor visits, but it might reduce necessary ones as well. That&apos;s a lot of information, so here&apos;s the upshot: Reasonable people could disagree on this. Leavitt, for his part, stressed that the link between insurance and outcomes is murky. Fendrick, meanwhile, thinks health outcomes would likely be worse under Bush&apos;s plan. But here&apos;s one more important point: This question wouldn&apos;t even affect many Americans whose employers would simply continue providing coverage. Rather, Bush&apos;s plan would disproportionately affect lower-income people, according to several nonpartisan experts who spoke to NPR. Aside from potentially cutting Medicaid benefits, the size of Bush&apos;s tax credits is adjusted based on age, not income, according to the New York Times. "This is not a wise path if one&apos;s priority is to protect Americans facing the greatest economic and health risks," said Harold Pollack, professor at the University of Chicago&apos;s School of Social Service Administration, in an email. Bush&apos;s plan does lay out a lot of information, but a few important parts aren&apos;t specifically explained. For example, it says there would be a "transition plan" for the 17 million people currently covered by Obamacare, but it doesn&apos;t explain what that plan looks like. "It would be a huge transition from Obamacare to a plan like this, which would be a huge disruption," Leavitt said. "If this were to become a reality, there would be a lot more details required about how that transition would work." There&apos;s also the cost. The Bush campaign says it believes the plan would reduce the deficit. But there aren&apos;t enough specifics here to really know what that might look like. We do know that repealing Obamacare could be expensive. The Congressional Budget Office estimated earlier this year that repealing the Affordable Care Act would add $353 billion to the deficit. Bush&apos;s plan would mitigate some of these effects, like with his replacement for the Cadillac Tax, but it&apos;s unclear to what degree, as well as how the rest of his plan&apos;s costs and cost-cutting would balance out. What is Jeb Bush saying with this plan? Wanting to repeal Obamacare doesn&apos;t itself set Bush apart from other Republicans — calls for Obamacare repeal have been constant since the law passed in 2010. But the plan does send a couple of political messages about Bush. One is in setting his priorities. Opponents may attack Bush for the plan&apos;s potential effects on lower-income Americans, but it does accomplish other, decidedly conservative economic goals. "It&apos;s important to see these replacements not as doing everything the ACA did but as fulfilling other policy aims: less regulation, cutting taxes and reducing federal spending," Leavitt said. Moreover, Bush seems to be staking out a position as the substantive, policy-wonk GOP contender. His detailed repeal-and-replace plan, on top of his other recent tax and energy proposals, for example, could help cement that identity.